Do you use carpets in your home? This is Lenin. 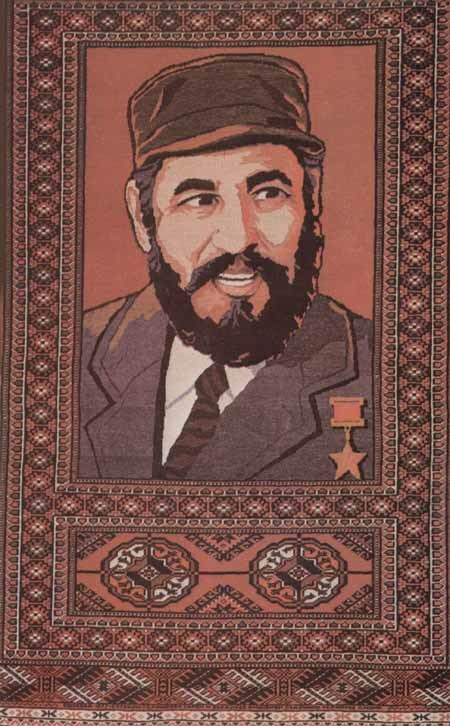 The most popular hero of Soviet propaganda carpets. This Lenin lacks some details but it’s definetely Lenin again. And again Lenin is in the middle and different happy workers of Soviet Russia surround him. That is Fidel from Cuba. He was a big friend of Soviet people. 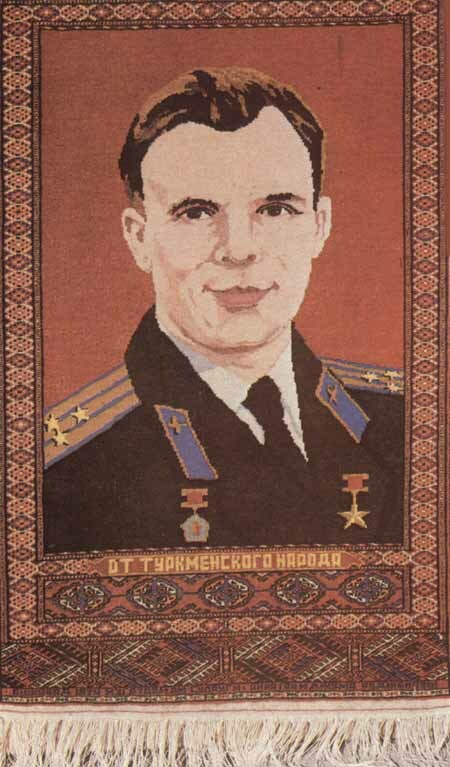 This is Yuri Gagarin, the first Russian spaceman, as it has been said, the first man that flew to space. This is Budenniy, Russia military leader from the dawn of Soviet state, back to 1917. This guy is Trotsky, he was also in the Revolution but after he quarelled with Stalin and ran to London where he was killed by KGB agent with a hammer. 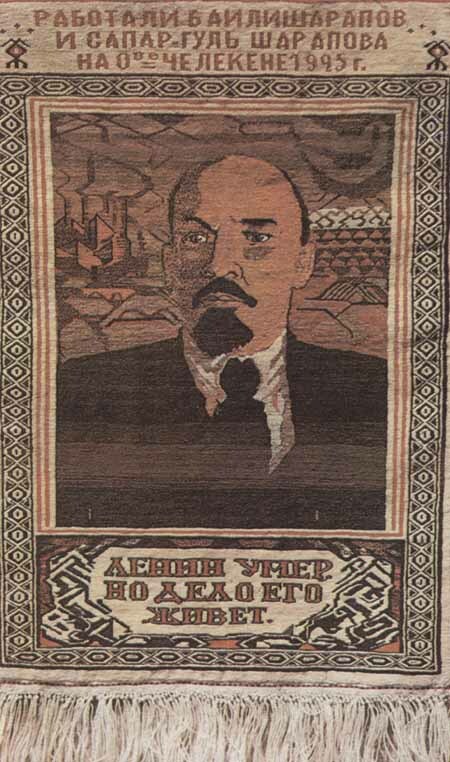 Hmm… By the time propaganda made it to carpets Trotsky’s very name was an anathema, nevermind the image or ideology. 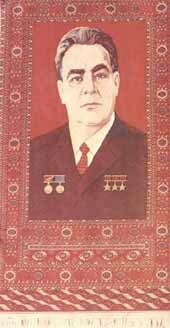 The carpet depicts Kalinin, in the 30s the Chairman of the Supreme Soviet that is a nominal President of the Soviet Union. “Trotsky ran to London” is also a good one. After his deportation to Turkey he was denied visa in nearly every country he applied to. So, after short and restricted stays in Norway and France he ended up in Mexico where he indeed was eventually murdered. Leon Trotsky (Lev Davidovich Bronstein) was in Mexico when he was attack with an ice axe by KGB agent, he died the next day in hospital. Wasn’t it an icepick, not a hammer? …he ended up in Mexico where he indeed was eventually murdered. and wasn’t it an ice axe? in mexico? and he lived till the next day to! Trotsky’s biography “My Life” is a must read. Say what you will about the guy, he knew what he wanted and he knew how to get it. Peacenik forgot about his stay in Constantinopel 🙂 He was also not murdered by a hammer, but (famously) by an icepick. Wasn’t Trotsky killed with an icepick in Mexico City? 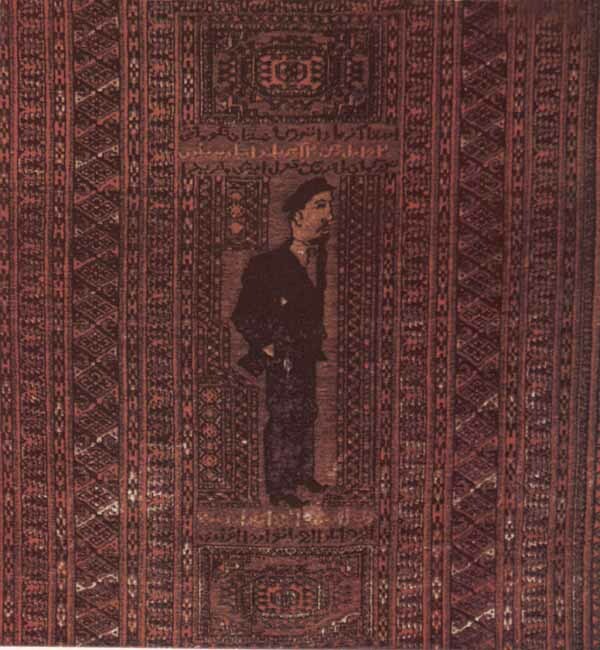 Dude – if you can get ahold of these carpets you can sell them on eBay. Let me know! Entrepreneurial opportunity for you! I did not. I mentioned it in general form as “Turkey” precisely because I know that Prinkipo island where he was kept is not exactly Constantinopol. Otherwise I agree with you. In addition to “My life” I would also recommed Isaac Deutscher trilogy and Jean van Heijenoort (Trotsky’s bodyguard/secretary) memoire “With Trotsky in exile: from Prinkipo to Coyoacan”. Back to carpets. As much as I can see most of them are the products of Turkmenistan, not of Russia proper. @Acts_of_Atrocity: Very well put. I thought “London” smacked of Litvinenko story spin, but was not sure. You nailed it. Trotsky was killed with an ice axe in his residence in Mexico by a compatriot of mine: Ramon Mercader. He was a catalan communist who after fighting in Spanish Civil War joined NKVD (KGB) during Stalin’s regime. Something curious: his mom was also a soviet agent and also attempted to kill Trotsky before his son succeeded. Before his death, Trotsky tried to defend himself biting Mercader and asked his guards to do not kill him. Finally, Mercader was judged and spent close to 20 years in prison. After being released by Mexican authorities, he spent most of his life in between Russia and Cuba, working for KGB. 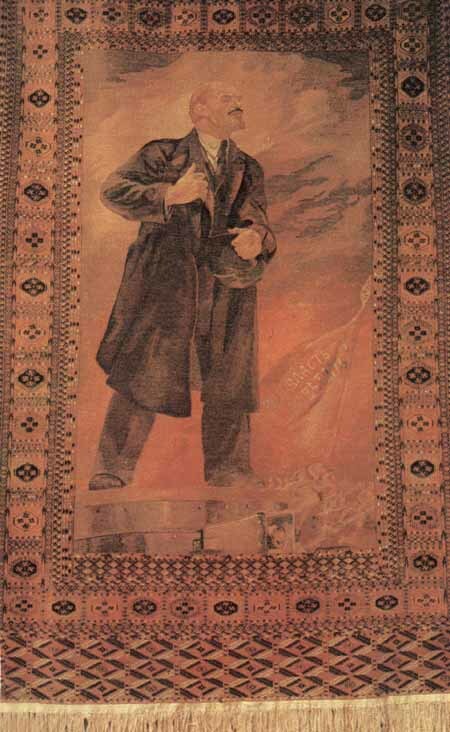 Mercader was very loyal to his ideology and never betrayed his comrades: his dream was to go back to Catalonia to spend his last days there when democracy was recovered in Spain, but local communist leaders asked him to confess who ordered to kill Trotsky if he wanted to get their help to go back to Barcelona. He refused to do it so and died in Cuba. He was named ‘hero of the soviet union’ (soviet highest medal) and was buried with honors in Moscow. PS: No need of propaganda, anyone could guess that behind of what’s going on with Litvinenko (former KGB agent poisoned in London) are Russian secret services or other pro-kremlin forces like Ramzan Kadirov, who probably is behind the murder of journalist Anna Politkovskaia. Xavi: Please provide some factual evidence to prove that Politkovskaya was murdered by the Kremlin forces. And no more “theories” please, only facts! Because I can give many theories too, for example, that Politkovskaya was murdered by Boris Berezovsky, who’s willing to make a revolution (do you understand this word?) in Russia as he recently stated in his interview. For Berezovsky Anna’s death is an obvious advantage in convincing the West that Kremlin is too powerful and dangerous. Also, Berrezovsky is protected by the British government, so I can even say that Politkovskaya was murdered by the West. How about that? As for Litvinenko, I don’t know if he was indeed poisoned by Kremlin (no evidence to prove that), but he should’ve kept his mouth shut. What do you think, you can work for a Secret Service and then betray your country and tell your enemies all the secrets?? He must be one dumb s.o.b. Yuri’s right. They’re tapestries, not rugs/carpets. After all, walking on Lenin’s head kinda isn’t exactly respectful is it? A carpet is a full length thing, covers most of the floor. A rug only covers a section of the floor and is an independant thing that you can move from place to place without disturbing as much of the room as if you were to move a carpet. 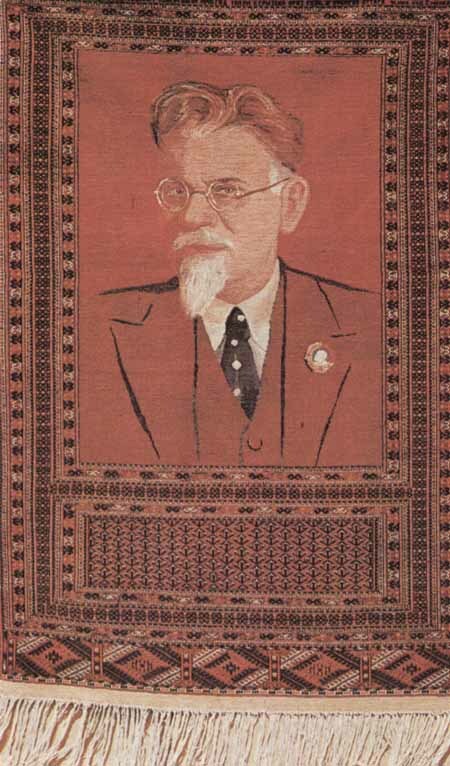 Firstly, the person depicted on last carpet is not Trotsky but Kalinin. Secondly Trotsky was killed in America, not London. I’ve been wondering why Russians have carpets on the walls at their homes but not on the floors. Everybody’s wearing slippers instead. Could somebody explain this? In Russia carpet walks on you~! Don’t you know that everyone who ran from Russia hides in London??? 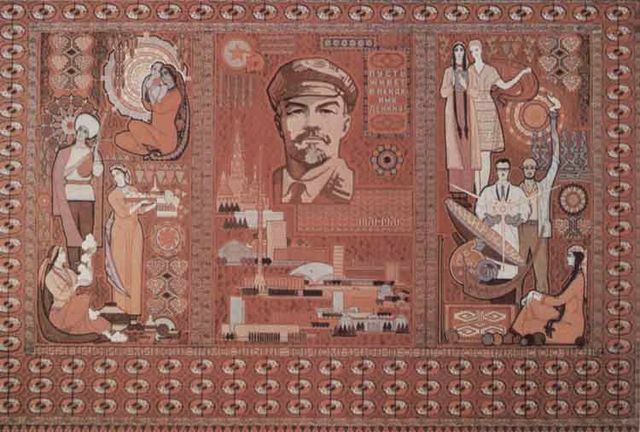 English Russia » Soviet Propaganda… Carpetsvery nice good article. thank you. 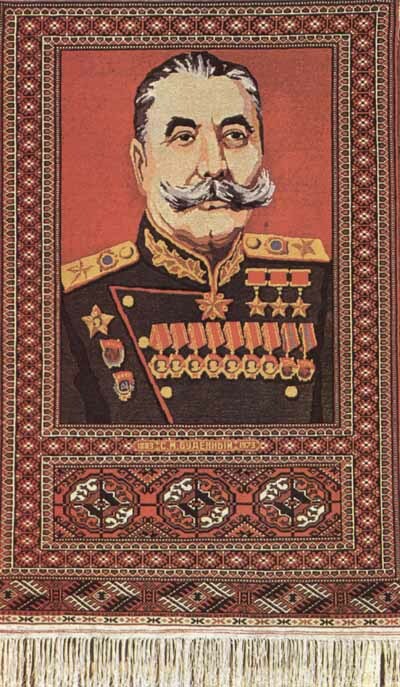 budyonny, that schmuck.. somebody tell him there’s room for more rombs on his moustache. I would bet you don’t know that Leon Trotsky granddaughter works for the CDC in Atlanta. Funny how a lot of the Kids and grand kids of the old founding Communists found their way to the United States. As for General Budyonny, have to admit the moustache is a bit of an eye catcher, you remember that, sort of like General George S. Patton’s Ivory Stocked Colt Peacemaker, you remember that sort of stuff. I would go riding with General Budyonny anytime. There is a breed of horse named after the Russian General is it not? 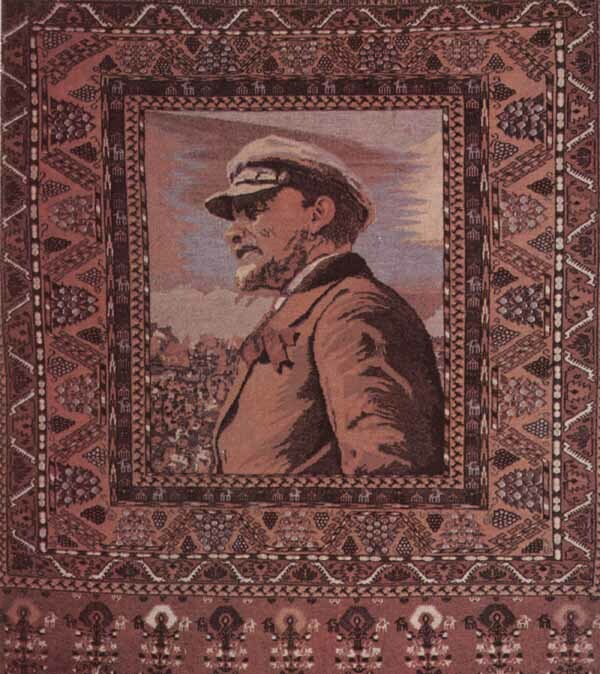 Last carpet is KALININ, not Trotsky. he was murdered with an ICEPICK by a secret agent sent by Stalin, the name of the agent… Ramon mercader del rio. Stalin pretty much murdered anyone he dislike.